As you may or may not know (you probably don't know if you're an entirely new visitor), I've been collaborating with my friend J.B. Martins on a regular webcomic focused on cinema and pop culture. It's called Kubrick's Garage. You might have heard of it if you used to follow my other blog, or follow me on deviantart or twitter - I pretty much talk about it a lot, not only because I want to promote it, but because I'm genuinely proud of this project. J.B. delivers consistently funny scripts, and I love drawing them. But since I haven't posted anything about the webcomic on this blog so far, I'll leave you with the latest strip, number 17. 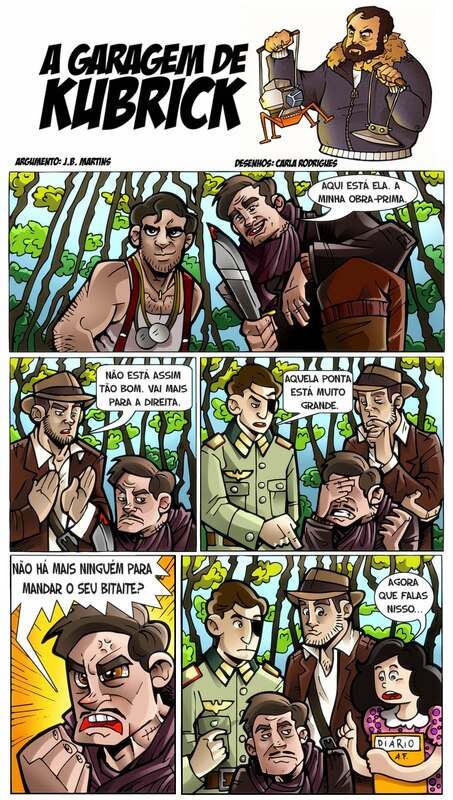 I apologize that the text is in portuguese, but I didn't get a chance to translate it yet. Click on the page to see it bigger! By the way, Kubrick's Garage has a fan page on facebook, where we post sketches, finished strips, and all kinds of other goodies. So come join us there: Kubrick's Garage on Facebook. mas ontem tive tentado a ter outra vez, mas depois lembreime porque é que apaguei aquilo. 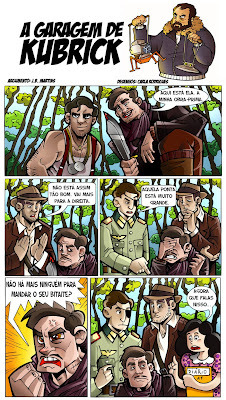 É o único webcomic que eu sigo regularmente.